Booking an award ticket through Korean can be a grueling process as I experienced this past week – necessitating several phone calls, a scanner and even a fax machine. 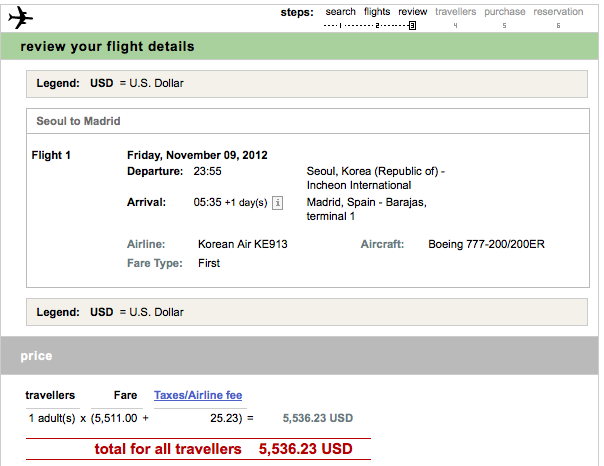 However, being able to book some premium award tickets on Korean was definitely worth the effort. Here’s what I had to do. I wanted to book two award tickets in Korean Air’s newest Kosmo Sleeper Suite first class aboard a 777-200 from Seoul to Madrid in November. Before calling Korean Air, I found the flight I wanted on the date I wanted, but I wasn’t able to see whether there was first class availability using Korean Air’s Skypass search for international tickets because I didn’t have enough miles in my account. I checked ExpertFlyer and there were indeed two first class award seats available so I called Korean Air directly and reached a representative who confirmed that two first class award tickets were available for the flight I wanted and would require 80,000 Skypass miles each plus taxes and fees. 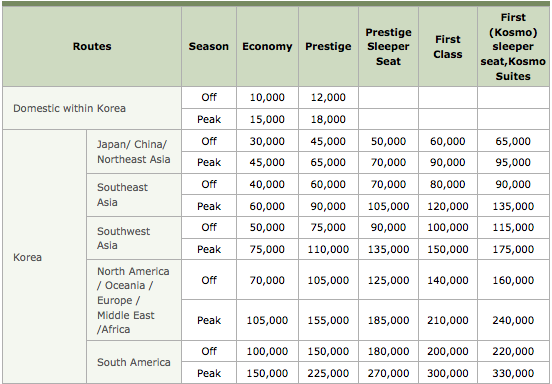 The award mileage requirements on Korean Air’s website are listed for roundtrip awards – but the airline allows one-ways for half price. Here’s where it got really interesting. I was able to put the tickets on hold, and I would have ten days both to redeem my miles and pay the fees and taxes. All I had to do was give them my Skypass number to attach to the reservation – so far so good. 80,000 points per ticket was a pretty hefty charge, but out of curiosity, I looked up the cost of my itinerary and it turned out to be over $5,500 per ticket, so I was getting a value of 6.9 cents per point and I would avoid having to connect through another city. I would have loved to use SkyMiles to book this award, but Delta does not allow international first class redemptions, which is extremely annoying. Had I bought my first class ticket, it would have cost $5,500! Then I hit a couple minor snags. The first was: I had been planning to transfer a total of 160,000 Chase Ultimate Rewards points to my Skypass account to redeem for both tickets, but was informed that since there were two people listed on the reservation the points for each individual ticket had to come from each passenger’s own Skypass account. I wanted to make sure my points would transfer instantly, so I did a test transfer of 1,000 points to my own Skypass account, and it went through in less than a minute. However, I didn’t realize that once I transferred the first 1,000, I would not be able to make another transfer to my Skypass account until 10:00 am ET the next day due to transfer limits in the Ultimate Rewards – Korean Air partnership. It seems you can only transfer points from one Ultimate Rewards into one Skypass account each day. In the meantime I could still transfer points to the other passenger’s Ultimate Rewards account to transfer into his Skypass account, which I did immediately. Note: some people have had issues lately with transferring their Ultimate Rewards to other people, but since I was transferring points from my Ink Bold card to another employee’s account for a business trip I wasn’t violating any rules. While it’s not listed on the website (at least not anywhere I can find), some Chase reps will tell you that you are only supposed to be able to transfer to spouses/domestic partners/ family members/ employees. I’m working on getting more clarification from Chase on this subject, but just FYI a few people have had their accounts shut down for external transfer activity. Thinking the worst was over and the tickets would be confirmed once the points were in the accounts, I called Korean Air again to make sure. This time they told me that I would have to fill out redemption forms for each passenger and fax them over along with proper photo ID for each passenger, which in this case included scans of our passport photo page. Faxing? Really?? To find this form go to Koreanair.com > Skypass > Forms and it is the SKYPASS Family Mileage Pooling Plan / Bonus Award Redemption Form. The representative confirmed that the tickets remained on hold and would stay that way for several days but I was skeptical since it seemed like such a process compared to booking on other airlines. Still determined, I faxed over the forms for both of us to Korean Air’s US fax line (310- 417-5678) and waited until the next morning to transfer the remaining 79,000 Ultimate Rewards points to my own Skypass account. Once I was able to confirm that both accounts each had a balance of at least 80,000 Skypass miles I called Korean Air yet again to wait to speak with a representative. 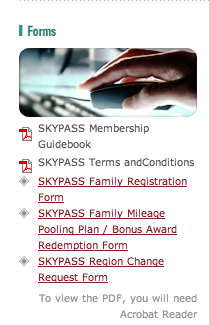 My Skypass account now shows the 80,000 miles that were transferred and then redeemed for the first class ticket. The airline was able to see that the points had posted and they had received the necessary paperwork so the tickets could be completed. The last step was to pay the taxes and fees which only took a couple of minutes and ended up being $196.23 for each ticket. Unlike each passenger having to redeem his own miles, I could pay the taxes and fees for both tickets with a single credit card. Finally it was time for the fun part. One feature of the website that I thought was nice and very interactive compared to the rest of the site was where you can choose your seats. Once the tickets were no longer on hold, my account was updated and the option was available to choose the seats I wanted. While I thought the site was very slow and a little confusing to navigate, this part was great and we got two seats right next to each other in the second row of first class. 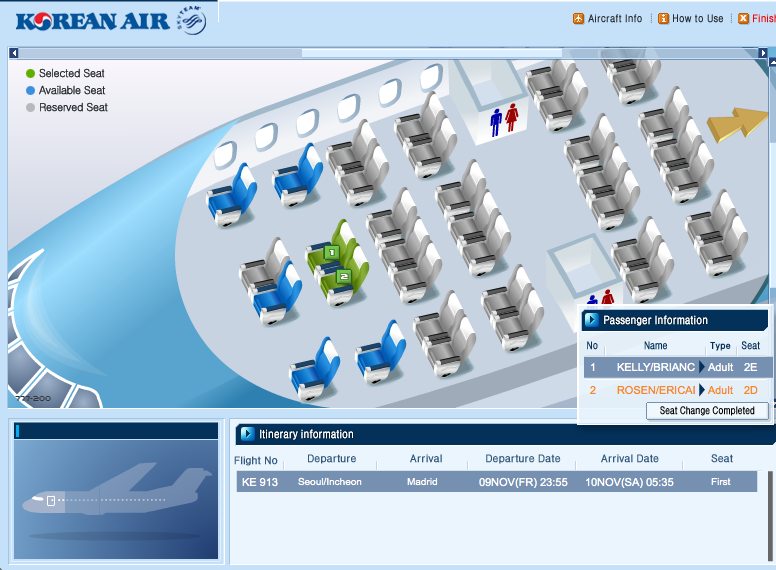 The first class seat map on Korean Airs Boeing 777-200. Although the award redemption process was a bit convoluted, there were a few positive aspects to the experience. First, almost every time I called the airline, I was able to speak to a representative immediately without having to wait. Each one I spoke to was familiar not only with the award booking process and with finding award availability on the airline. (As a side note, that was in stark contrast to a call I made to Air France/KLM Flying Blue when I thought about using my miles there to book this flight. The rep couldn’t even find any Korean award availability and wanted to route me through Guangzhou on China Airlines instead on a different date!). At times we had trouble understanding each other, but they were always patient and asked if they didn’t understand something, so I found it all to be very pleasant. I do think Korean Air needs to work on updating their award booking process to make it paperless as well as easier for their customers. After all, South Korea is one of the most technologically advanced countries on earth – the fact that you can’t book an award ticket online is mind-boggling. Just booking a simple one-way award ticket was very time consuming and though I definitely do not look forward to the rigamarole of booking award tickets through them in the future, I will say that the very solid value I got from my points made the experience well worth it and I can’t wait to experience those Kosmo Sleeper seats. I’ll just have to hope that by the time I redeem again they will have changed the system and done away with the fax machine!